The regiment remained around Petersburg, doing fatigue duty and also fighting in the Battle of Hatcher’s Run in October 1864. Later, the War Department reassigned the regiment, and it was employed on the front lines in active duty around Richmond (especially at Dutch Gap Canal) until the fall of the Confederate capital. 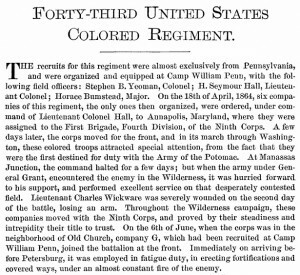 The full summary of the 43rd USCT Regiment’s actions during the Civil War as well as the complete muster roll is available through Google Books in volume five of Samuel P. Bates, History of Pennsylvania Volunteers, 1861-5 (1871).